THE NEW 2018 FACELIFT - NIGHT PACKAGE - PREMIUM PLUS PACK!!! 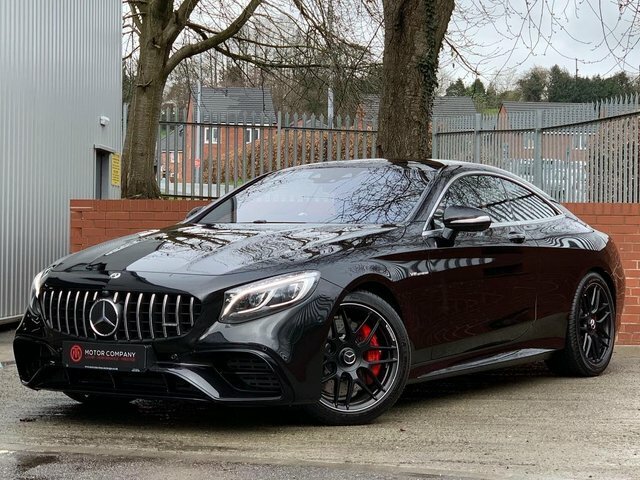 Finished In Obsidian Black Metallic Paint With Full Black AMG Exclusive Nappa Leather - With Grey Stitching and Seatbelt's In Grey. 5,000 Miles and Mercedes Benz Warranty Until March 2021. This Vehicle Comes Equipped With A Very Desirable Specification Which Includes: Premium Package, AMG Performance Exhaust System, Harman Kardon® Logic 7® Surround-Sound System, Parking Package, Interior air ionisation, Mirror Package, Night Package, Memory Package, 21' AMG Alloy Wheels Multi-Spoke Design, Painted Matt Driving Assistance Package, Heated Rear Seats, Bi-Xenon Adaptive Headlamps. An Epic Vehicle With The Perfect Specification. Please Call or Email To Discuss., FREE NATIONWIDE DELIVERY - 5.4% APR FINANCE AVAILABLE - 12 MONTHS WARRANTY!!! FULL MERCEDES SERVICE HISTORY - 18 MONTHS WARRANTY - CAPRISTO SPORTS EXHAUST!!! Finished In Selenite Grey Metallic Paint With Full Black AMG Performance Seats. 25,000 Miles With Full and Comprehensive Mercedes Benz Service History. 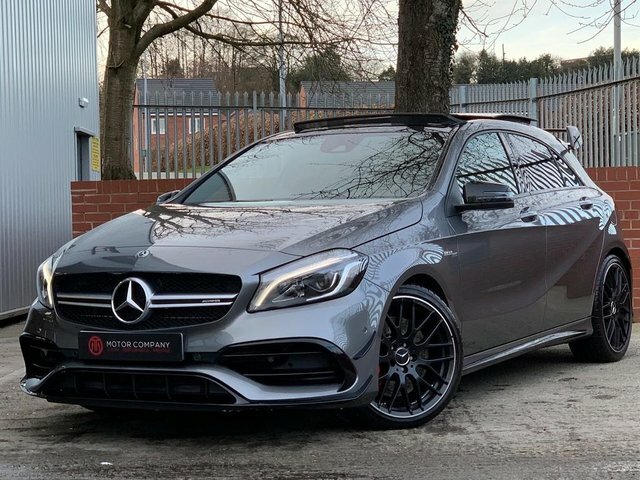 This 'Edition 1' Comes Equipped With An Epic Specification Which Includes: Capristo Sports Exhaust, AMG Dynamic Plus Pack, AMG Aerodynamics Package, AMG Performance Steering Wheel, Keyless Go, Mirror Package, Night Pack, Red Brake Callipers, Red Seat Belts, Reverse Camera, Lane Tracking Package, Parktronic, Blind Spot Assist, Carbon Fibre Roof, LED High Performance Headlamps, Burmester Sound System, Heated Seats and Privacy Glass. An Exceptional Example With An Unblemished History. Please Call or Email To Discuss., 4 owners, COMAND Online System, Hard Disk Drive Navigation with 3D Map Display, Live Traffic Information and European Map Data Updates, Cruise Control with Speedtronic Variable Speed Limiter, DAB Digital Radio, Heated Seats, Linguatronic Voice Control, THERMOTRONIC Automatic Climate Control, 19/20in AMG Forged-Alloy Wheels - Cross-Spoke Design, Bi-Colour Matt Black with High-Sheen Finish, Bluetooth Interface, Electric Windows (2) with One-Touch Control and Obstruction Sensor, Front Seats Electrically Adjustable with Memory, Hill Start Assist, Keyless-Go Starting Function, Radio, Single CD/DVD Drive with MP3 Compatibility, SD Memory Card Slot, USB, Media Interface, Internet Radio and Cable for iPod Connectivity, Rain Sensor, Tinted Glass - Green All Round Including Rear Window in Single-Layer Safety Glass, Tyre Pressure Monitoring System, Upholstery - Black Nappa Leather. 2 seats, FREE NATIONWIDE DELIVERY - 5.4% APR FINANCE AVAILABLE - 12 MONTHS WARRANTY!!! REAR SEAT ENTERTAINMENT - DRIVING ASSIST PACKAGE - AMG PERFORMANCE EXHAUST - NIGHT EDITION!!!! Finished In Obsidian Black Metallic Paint With Full Black AMG Nappa Leather Upholstery. This Ex-Demo Has Covered Delivery Miles Only and Is The Highest Spec'd Example On The Current Market With Every Conceivable Optional Extra Which Includes: Driving Assistance Package Plus, Rear Seat Entertainment Package With TV Tuner, Interior Air Ionisation With Air Filter, Night Edition, Parking Package, Mirror Package, 21' AMG Alloy Wheels Painted Matt Harman Kardon® Logic 7® Surround-Sound System, AMG Performance Exhaust, Red Brake Callipers, Apple Car Play, Active Lane Assist, Blind Sport Indicator, AMG Performance Steering Wheel, Panoramic Sunroof, Heated and Cooling Front and Rear Seats, AirMatic Package, Dynamic LED Headlamps and Privacy Glass. Please Call or Email To Discuss., 1 owner, 5 seats, FREE NATIONWIDE DELIVERY - 5.4% APR FINANCE AVAILABLE - 12 MONTHS WARRANTY!!! AMG AERO PACK - AMG PERFORMANCE EXHAUST - PAN ROOF - AMG EXCLUSIVE PACKAGE - AMG NIGHT PACK - HARMON KARDON - COMMAND ONLINE!!! Finished In Mountain Grey Metallic With Full Black Fine Napa Perforated Leather Upholstery. An Exemplary Vehicle With Only 1 Owner From New And Having Only Covered 6,000 Miles. No Expense Has Been Spared With An Extensive List Of Optional Extras Including: AMG Exclusive Package, Mirror Package, AMG Night Package, AMG Performance Exhaust, AMG Rear Aerofoil, Panoramic Glass Sliding Roof, AMG Ride Control, AMG Dynamic Select, 19' AMG Multi-spoke Alloys, Adaptive LED High Performance Headlights With High Beam Assist, Harmon Kardon logic 7 Surround Sound, Command online, Cruise Control, Attention Assist, AMG Performance Seats, Designo Seat Belts in Red, AMG Performance Steering Wheel, Parking Pilot With Reversing Camera, Apple CarPlay, Remote Online, Heated Front Seats, Ambient Lighting, Keyless-go, And Privacy Glass. A Completely Unblemished Example Of Arguably The Hottest Hatch Available On Today's Market With Most Certainly The highest Spec. Please Call For More Information., 5 seats, FREE NATIONWIDE DELIVERY - 5.4% APR FINANCE AVAILABLE - 12 MONTHS WARRANTY!!! With a superb range of used Mercedes-Benz cars for sale in Congleton to choose from, you should have no trouble finding a model to suit your lifestyle and budget. At TMT Website Account we're committed to delivering excellent customer service and will always go further to ensure our customers drive away with a smile. If you're in the market for a sporty hatch like the Mercedes-Benz A-Class or require an elegant and supremely well-equipped executive model such as the C-Class Saloon, our team is here to help. Take the opportunity to browse our complete stock of pre-owned Mercedes-Benz cars here on the website and be sure to speak to a member of the team if you have any questions or wish to arrange a test drive.